The first workbox of the day is always the same for Margaret: her All About Reading Work. All About Reading is a comprehensive phonics, reading, and handwriting curriculum. Margaret is currently working through Pre-Level 1. This level mainly focuses on letter identification, basic letter formation and sound, and rhyming words. I have found that this program worked perfectly in the workboxes once Margaret got into the general routine of the program. I review the lesson for the day the night before and prepare the materials she will need. I place the craft sheet and the reader in her box. If there are additional materials for the day, such as rhyming or letter cards, I put those in box two or three. She's doing a great job with the program and I definitely think that we got our money's worth. It is not a cheap program, but it is a complete program without gaps or gimmicks. She is moving through the Pre-1 Level fairly quickly and I imagine she will be moving into AAR 1 shortly after Christmas. I reviewed All About Reading 1 for the Schoolhouse Review Crew earlier this year. You can read that review by clicking here. 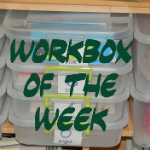 Check out my other Workbox of the Week Ideas HERE!